The Congregation are invited to use this page to display their thoughts, prayers, comments or pictures. If you have something you wish to include on this page please send to John Urquhart or Evelyn Pottie. Nairn Old Parish Church invites applications for the post of Organist and Choirmaster: to play at well attended Sunday morning worship, direct our enthusiastic choir and work with our Minister, Rev Alison C Mehigan, to develop the role of music in our congregational worship. We wish to appoint a suitably qualified and/or experienced person, who has good people skills, combined with an enthusiastic approach to leading and developing our musical praise. In addition, the successful applicant will be expected to play at worship during Holy Week, Christmas Day, two afternoon Communions and end of term school services. 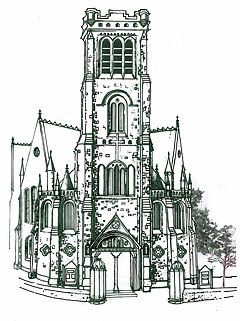 The well-maintained pipe organ was manufactured by Norman and Beard in 1903. Remuneration is within guidelines of the Scottish Federation of Organists and dependent on skills and experience. month by mutually suitable arrangement. end of May in each year, or at such frequency or times of year as may be agreed with the Employer. be entitled to a fee. 5 Carrying out additional duties as may be reasonably requested from time to time. Kirkside , 1 Manse Road, Nairn. for particulars see Church of Scotland web site. If you were fortunate enough to read the latest edition of the World Mission magazine, you will know that it was all about Fair Trade. 21 years have passed since Fair Trade was introduced to our retail system. It has been a slow process but is now well established. The idea behind Fair Trade was to help farmers and producers in very poor parts of the world who struggled to produce their goods and were then forced to sell to large co-operatives who paid them very little. Nowadays, Fair Trade offers fair prices for goods produced. This has resulted in lifting farmers out of poverty and has seen their lives improve beyond their dreams. Recently Rev Alison spoke about ‘Choices we face’ and trying to make the right choice. When we are in the supermarket, we can make a choice, choosing an item with the Fair Trade logo, even if it is a few pence dearer (not always the case) By doing this we are helping to improve the lives of our brothers and sisters across the world. Although many now receive help, there are thousands still living in poverty beyond anything we can imagine. Please pray for them in their struggle to live. We recently celebrated the Sacrament of Communion, the first time it has been conducted by a female minister. In 1900 Lady Frances Balfour, a leading Scottish Suffragette, gifted our Communion table to us. She was a daughter of the Duke of Argyll and a leading aristocrat. She was married to Estace Balfour brother of Tory Prime Minister Arthur Balfour. Lady Balfour came from a Whig background and was a regular visitor to Nairn visiting Lord Finlay of the Newton. The leader of the Suffragette movement in Nairn was our first minister Rev. W. R. Pirie. Lady Frances was a staunch supporter of the Church of Scotland and always attended the Assembly. She was a great believer of women's position in the church and after 116 years, a woman has celebrated communion at the very table she gifted. Our thoughts and prayers were with the Rev. Alison on this historic day. 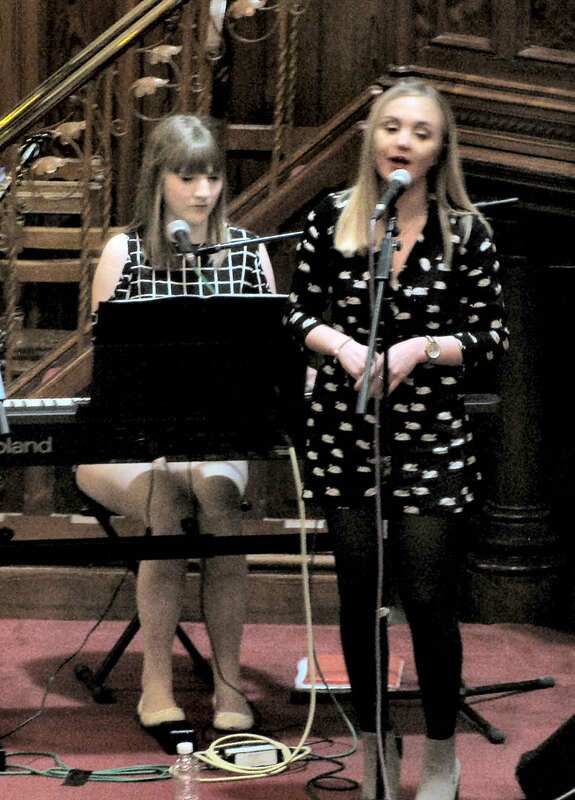 Pictures from the very successful concert of the Speyfest Young Entertainers, held recently in our church. 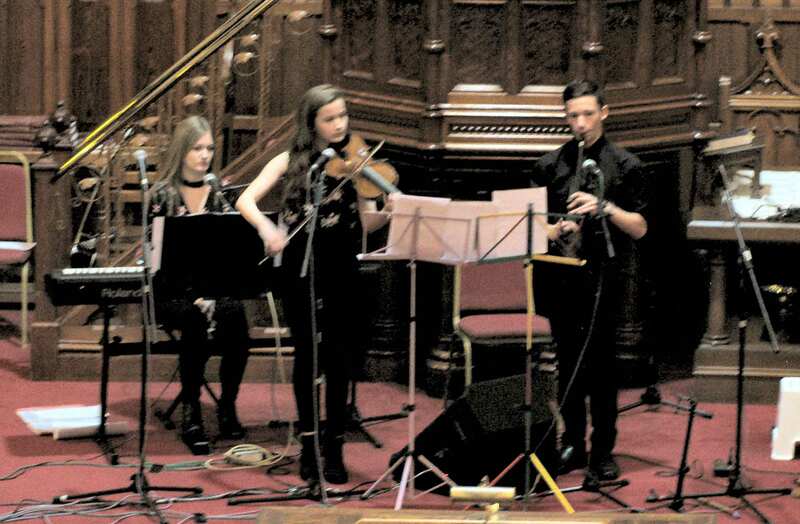 This was the first of a Tour of Concerts being undertaken by musicians and dancers who had taken part in SPEYFEST YOUNG ENTERTAINERS COMPETITION. We were treated to delightful evening of music and dance by this group of very talented young people. The story behind the hymn tune. A few Sundays ago we sang Hymn 342 to the tune "Une Jeune Purcelle". This is the tune used for The Huron Carol which has an interesting story to tell. The song is regarded of one of the early carols from Canada. It was written in 1643 by father Jean de Brebeuf, a Jesuit Priest who left the shores of France to the Newlands of Canada to the land of the Huron Indian. He did not speak Wendat, the language of the Huron and he had no idea of their beliefs or they his. Wendat was not a written language so Father Jean sat down and created a dictionary, which is still in use today. When he had learned enough words he decided to write poems and songs in their native tongue. Wendat does not have the letter M or its sound which makes telling the story of Mary & Joseph a wee bit difficult, but the nearest sound was that of the French oui, so Mary became wairie. It became the Huron Carol and the original Huron title is "Jesous Ahatonhia" ("Jesus, he is born"). Usually when sang it starts in Wendat then it is translated into French as it was written and then English. The Huron Carol - checkit out in Youtube.